It was big news on Wednesday when Walmart Inc. agreed to buy most of Flipkart, India’s leading e-commerce company. Another online shopping king made a couple of moves that showed the importance of trying and buying in the real world. First, Amazon.com Inc. said Wednesday that it had started to open “experience centers” in model homes to give people a taste of life intertwined with Amazon gadgets and services. The company wants potential buyers to walk into a demonstration house and try asking Amazon’s Alexa digital assistant who’s at the front door, stream Amazon Music on an Amazon Echo speaker, re-order toilet paper with an Amazon Dash button and book an appointment through Amazon Home Services with a contractor who will clean the gutters. It is a glimpse of homeowner heaven, or Amazon’s version of it. It’s hard to imagine huge numbers of people will become Amazon domestic devotees after seeing these demos. But the effort is more evidence of Amazon’s move from the digital domain into the physical world to keep expanding its hold on consumers’ wallets. The same motivation was evident in a partnership that Sears announced to allow people to buy car tires on Amazon and have them delivered and installed at some Sears auto centers. It turns out that people want to browse, shop, pick up or return in person, and Amazon is changing to meet those demands. 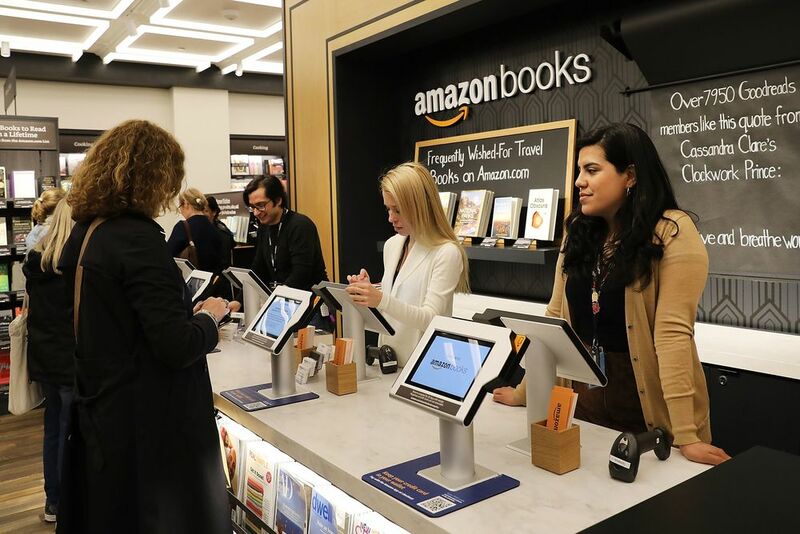 And Amazon’s new strategy often involves branching into physical stores or other ways to connect with shoppers offline as well and online. Note: Figures are adjusted for seasonal variation, and some data are preliminary or revised. Amazon’s purchase of Whole Foods supermarkets, its growing chain of bookstores, its string of university outposts, its experiment with convenience stores, its gadget kiosks in malls and its mini-stores inside some Kohl’s department stores are also ways that Amazon is trying to meet the shopping masses where they are today, in the physical stores where 90 percent of U.S. retail sales take place. The internet has taken over some categories of shopping — book buying and consumer electronics, for example, mostly thanks to Amazon. But there are many huge categories such as cars, appliances and groceries that people still buy nearly entirely in person. For auto parts and accessories — the category covered by Amazon’s tie-up with Sears — only about 4 percent of sales take place online, according to a KeyBank Capital Markets research report from October. The internet has swept through some categories of consumer spending such as books and electronics. Others have barely been touched by e-commerce. Devices and internet services for the home particularly need a personal touch. As internet-connected appliances, thermostats, home-security and entertainment systems become more sophisticated, people need help in person to figure out how to install them, connect them to other gadgets in the home and get educated on how and why they should stitch them into their domestic routines. Amazon knows this, and that’s why it’s trying the Amazon-infused demo homes, and why Amazon home devices get prominent play in Amazon’s bookstores and its mall pop-up stores. The future of shopping is going to be a mix of physical stores and online shopping. Conventional retailers are trying to prepare for this future by learning new tricks in cyberspace, as Walmart’s Flipkart acquisition shows. But Amazon is just as much in learning mode to figure out the rhythms of the masses who often want at least a dose of the brick-and-mortar experience. Amazon already controls close to half of all online purchases in the U.S., according to estimates from research firm eMarketer. To keep growing, the company needs to conquer consumer spending in the real world, too.